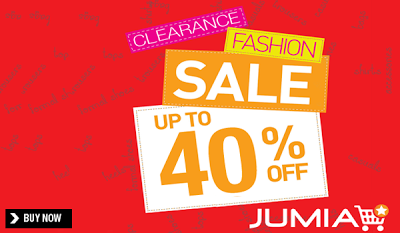 Jumia Kenya is offering shoppers some much needed retail therapy for the gloomy weather with a clearance sale of up to 40% off valid until September. The sale offers approximately 300 products to choose from on the latest fashion trends for both men and women’s clothes and accessories. The prices are as low as KSh. 1299. The items range from men’s and women’s clothing, shoes, bags and accessories. All high quality products at reduced prices. It is easy to buy clothes for women, men and children from top brands. Express your style and personalize your wardrobe in just a few clicks. No matter your size or your price range, you will find exactly what you need on Kenya's #1 online shopping website. Shoppers cannot afford to miss the savings only available exclusively from Jumia Kenya. Jumia Kenya is a new online shop in Kenya. Jumia Kenya is only 2 months old and have seen tremendous growth and potential in this field. They have a wide range of goods including electronics, shoes, apparel, home accessories and many more delivered right at your door step. Jumia Kenya is 100% convenient since one can shop from the comfort of their office or home 24/7, and securely make payments through Mobile Payment, Online Banking and Cash On Delivery. Step 2 - Register with Jumia an select a payment option. Step 3 - Have your products delivered within 2 to 3 days wherever you are in Kenya.